NEWS FLASH: Power BI reports can be deployed to SQL Server Reporting Services web portal. The production-ready release is targeted for mid 2017. This is much sooner than most folks in the community were anticipating. An installable technical preview is targeted for January of 2017. 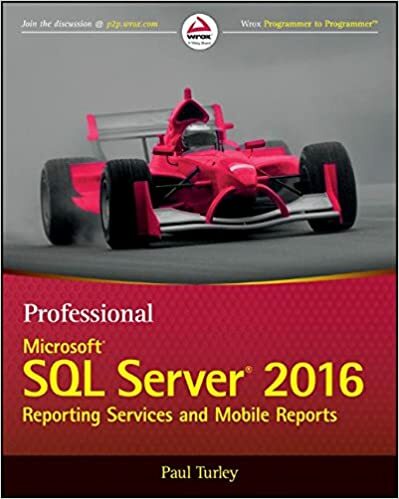 This announcement was just made on the SQL Server Reporting Services Team Blog. 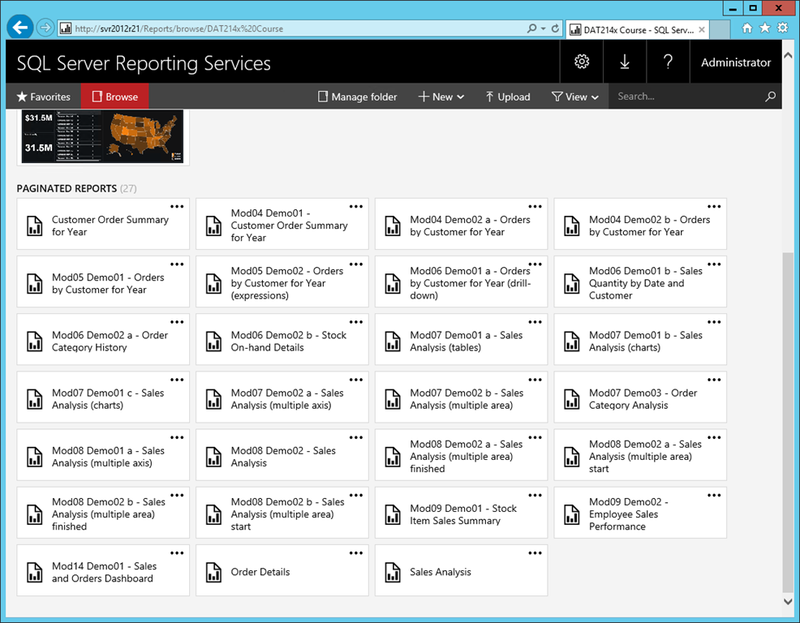 Which Power BI capabilities do you plan to add to SSRS? Given our focus on Power BI reports, we have no current plans to add other Power BI features (such as “dashboards,” Q&A, Quick Insights, and others) to SSRS. What can we expect in the next Technical Preview of Power BI reports in SSRS? With the current Technical Preview, we used a pre-configured Azure VM to offer you a preview that’s quick and easy to try. Our focus for the next Technical Preview is on a version you can download and install on your own VM or server, a necessary next step toward a production-ready version. Aside from this aspect, the functionality will be similar to the current Technical Preview’s. When will we have this next Technical Preview? We’re targeting January 2017 to release this next Technical Preview. What’s the release vehicle for a production-ready version? We plan to release the production-ready version in the next SQL Server release wave. We won’t be releasing it in a Service Pack, Cumulative Update, or other form of update for SSRS 2016. When will we have a production-ready version? We’re targeting availability in mid-2017. Can I deploy SSRS 2016 today and migrate to SSRS with Power BI reports when it’s available? Yes, we aim to make it easy to migrate to SSRS with Power BI reports from SSRS 2016 and previous versions. Posted in BI Industry, Business Analytics, Microsoft BI Platform, Power BI, Self-service BI, SolidQ, SQL Server, SQL Syndication, SQLServerPedia, SSAS Administration, SSRS Administration, SSRS Design. As I visit businesses, consulting clients and training classes, to teach data reporting and analytics; there is a recurring conversation. It is one that I have had for eighteen years. The audiences change and the technology implementations are a little different over time, but the essential conversation is still the same. This happened again last week as I was trying to explain the unique characteristics of Multidimensional and Tabular storage to a client. I’m developing a training course where I needed to explain the concepts once again – and then it hit me! …these unique data storage and analytic technologies do what we dream about in science fiction stories and achieve capabilities we imagine existing in the distant future. Channel surfacing on television this week, I watched an episode of Timeless, a Star Trek rerun and a Star Wars movie – where time-travel, space-warp travel and teleportation were commonplace realities. Although fictional as they were portrayed, I think these concepts are very real in our technology landscape. Please indulge me as I explain. We live in a Linear world. We reside in a place, work in a place, store and move stuff from place to place. Centuries ago, if man needed to move something (perhaps just himself) to a distant place, he would walk, ride a horse or take a sailboat. In weeks or months, he would arrive in another place. Today, we get in a car, navigate the streets, perhaps highways and Interstates and then arrive in a different place within minutes or hours. For longer trips, we board a large metal tube, sit very close to several complete strangers as we climb up into the sky; some period of time goes by and then we somehow arrive in a distant place along with our stuff. At 35,000 feet where the air is very thin, a jet airplane can travel many times faster; leaving an altitude where certain physical laws restrict speed, only to re-enter that atmosphere after it has arrived. To someone from the distant past, this experience would seem fictional. On a daily basis, I sit or stand in front of my computer monitors, and see and speak with people in distant places. We have live conversations about the weather in their time zone or hemisphere. Through some strange but now common process, technology converts our speech, images, directions, documents, effort and thoughts into 8-bit network packets and electrons that travel almost instantly through space; leaving the earth for a short period, to be transported and reassembled somewhere else. Years ago, when I wanted new stuff, I would drive to the store. If they didn’t have what I wanted or if it was too expensive, I would spend the day driving to different stores. Today, I “go” to the store on my computer and the very next day, my stuff arrives on my doorstep. We are continually inventing ways to bend space and teleport things within the changing confines of reality. Data storage is much like the real world. We store terabytes and petabytes (numbers we can’t even explain) in a small space. But, to navigate through the linear storage structure of relational databases and files, the data might as well be thousands of miles or kilometers apart. In order to perform time-variance and statistical calculations, program code must access a group of records in one location to aggregate them, and then find a related group of records – perhaps millions of rows apart – to perform another aggregation. The query might need to perform this operation dozens, hundreds or thousands of times; before it can calculate the final results. One of the best examples is a time-series calculation where a query must “visit” records for each time period to perform an aggregation. The effort is compounded when the goal is to compare aggregate values and variances for parallel and relative periods (e.g. “one year ago”, “three years ago”, etc.) 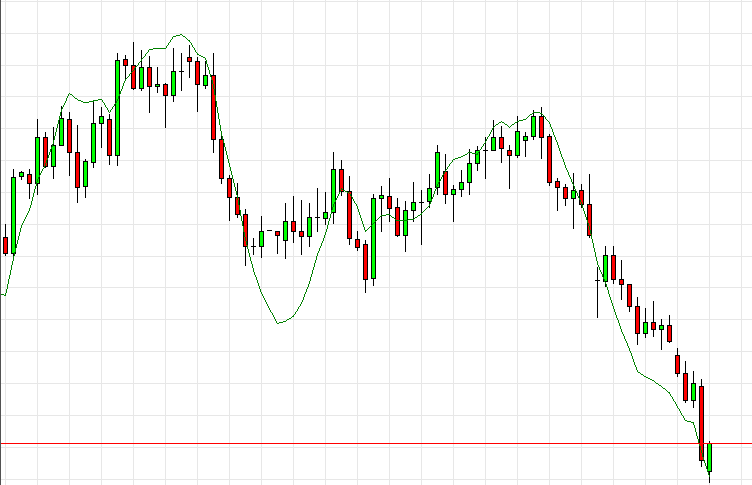 and then perform forecasting or regressions. In relational storage, the query engine must “drive” from place to place, navigating the streets (file groups, files, pages and rows) to find the records. 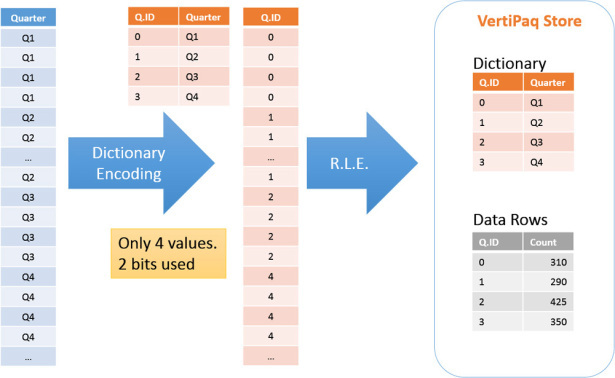 In an analytic structure (like an Analysis Services cube, or SSAS Tabular model or Power Pivot/Power BI in-memory model), the query engine performs a calculation operation and then teleports to a new location to find a different group of related records. In a multidimensional cube, the storage processing code quite literally folds space to create the cube structure and pre-calculate some of the aggregate values. Rather than leaving all the data in a linear table, it actually moves data segments close together, reshaping the data structure (thus, the term “cube”). This approach required a great deal of complexity in both the software and the resulting data structure. Advances in computer hardware and software techniques helped simplify the approach. The in-memory tabular model exists in linear, yet fragments of compressed space – where the actual distance between adjacent records is much closer than it appears to be. When the query process is done looking up a group of records it warps to the next group of related records using a memory address. Instead of traveling through space, it steps out of it, like the jet airplane leaving the atmosphere, to re-enter in a different location. It takes much less time to run queries because it is not moving through all the rows of linear tables. 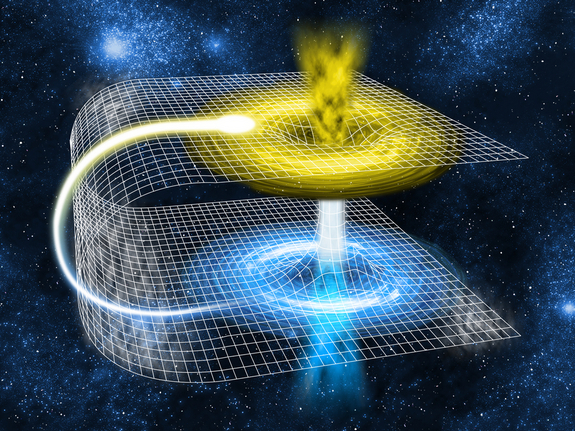 By using unique and innovative data storage methods (to reduce storage space and access data faster without moving through data), we can, in effect; perform time-travel, warp space and teleportation. Posted in Articles, BI Industry, BI Projects, Microsoft BI Platform, MVP Community, Power BI, PowerPivot, Self-service BI, SolidQ, SQL Server, SQL Server Pro Magazine, SQL Syndication, SQLServerPedia, SSAS Design, Tabular Models. I recently needed to replicate all of the reports on one report server to a different server. I started downloading each report one at a time to a file system folder, moving them to the other machine and then uploading each RDL file. Needless to say, that’s a slow and painful process. Since a new set of PowerShell command lets (Cmdets) were introduced for Reporting Service just a couple of weeks ago, I decided to give them a try and share the results. Aaron Nelson, long-time Microsoft Data Platform MVP and PowerShell fanatic, has literally been hounding me for the past few weeks to take some time and look at a new PowerShell library and scripts originally developed by Parth Shah from the SSRS product team. Jaime Tarquino also played a big role in automating the build process. It’s the personal commitment of folks at Microsoft like Parth and Jaime that really make a product like SSRS shine. Aaron can be pretty persistent and I admit it’s ironic that I’ve been too busy finishing up the final editing work on the Wrox SSRS 2016 book and the new edX SSRS course to look at these RS PowerShell CmdLets but I’m glad that I did because they’re an absolute gold mine. This saved me hours of time and provided peace of mind, knowing that I could easily automate large migrations in the future. You need to be running PowerShell as Administrator in order to do this. 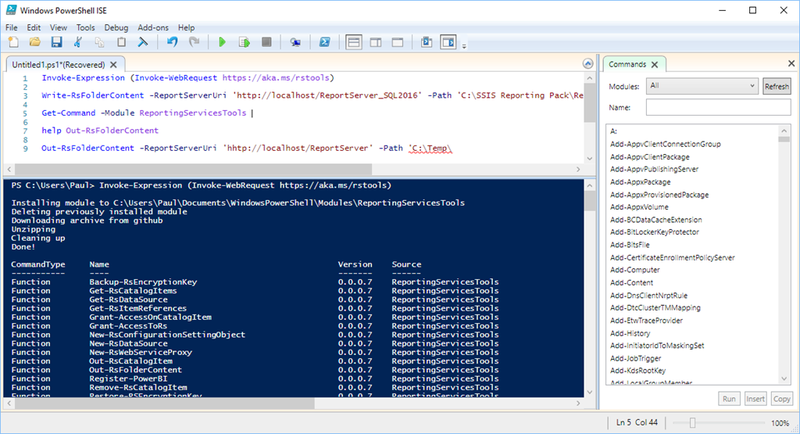 If you have access to multiple report servers, you only need to run PowerShell commands on one machine. Folder recursion is supported if you have nested folders. I think you’ll find these commands can help speed up your Development Lifecycle. Thanks again to Parth, Jaime, Aaron, Chrissy, Riccardo and the rest of the product team for making this possible! Posted in BI Projects, MVP Community, PowerShell, SolidQ, SQL Server Pro Magazine, SQL Syndication, SQLServerPedia, SSRS Administration. I’m pleased to present a four-week, on-line SSRS 2016 course on behalf of Microsoft; hosted on the edX platform developed by Harvard, MIT and other major universities. The first session began this week but there is still time to get started. Additional sessions will also be offered in the future. This is not a promotional free trial or some kind of limited offer to get you to sign-up for a more expensive training class. It is high-quality, in-depth training sponsored and produced by Microsoft for free, and led by yours truly – and co-presented by Chris Randall; Senior Content Developer for Microsoft Learning Experiences. The course, with all the materials are free. If you would like an official verification certificate, it’s optional and a mere $49 extra. This course provides general knowledge, helps students develop basic, foundational skills and then focuses specifically on data visualization using existing and newer SSRS features. Whether you’re new to reporting services, or experienced with earlier versions, we’ll show you how to build tables, matrices, advanced visualizations, and dashboards with key performance indicators. You’ll design and deploy compelling, interactive reports for smartphones, tablets, and browsers. By the end of the course, you’ll have developed a complete reporting solution and be ready to analyze and visualize your own business data with SQL Server Reporting Services.